From 1935 until 1975, just about every junkie busted for dope went to the Narcotic Farm. Equal parts federal prison, treatment center, farm, and research laboratory, the Farm was designed to rehabilitate addicts and help researchers discover a cure for drug addiction. Although it began as a bold and ambitious public works project, and became famous as a rehabilitation center frequented by great jazz musicians among others, the Farm was shut down forty years after it opened amid scandal over its drug-testing program, which involved experiments where inmates were being used as human guinea pigs and rewarded with heroin and cocaine for their efforts. 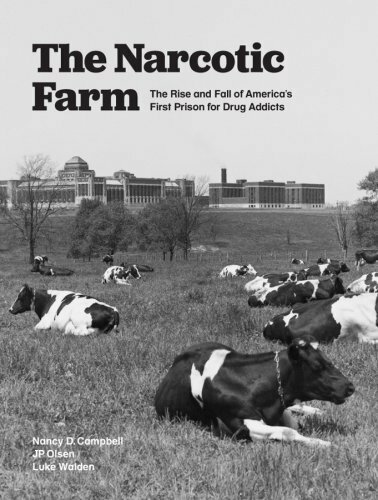 Published to coincide with a documentary to be aired on PBS, The Narcotic Farm includes rare and unpublished photographs, film stills, newspaper and magazine clippings, government documents, as well as interviews, writings, and anecdotes from the prisoners, doctors, and guards that trace the Farm’s noble rise and tumultuous fall, revealing the compelling story of what really happened inside the prison walls. The Narcotic Farm is a beautiful, fascinating book that takes readers deep into a forgotten American institution. The pictures are remarkable and the story brings an important moment in history vividly to life. It’s a stunning work. The story of America’s long and deep affair with addictive drugs is incomplete without mention of the legendary federal narcotic hospital in Lexington, Kentucky. The Narcotic Farm tells this story well, and in addition provides a wealth of revealing photographs and documents that speak volumes on what it was like to be a junkie in the mid-twentieth century. The Narcotic Farmworks its magic by recapturing, in images and words, the lost world of “Narco,” the sprawling federal prison-hospital for drug addicts in Lexington, Kentucky. It’s the details that get you, from the disheveled misery of withdrawal to the uninhibited joy of performing in the house jazz band. Everyone who cares about addiction and recovery in this country should look at these pictures and read this text.